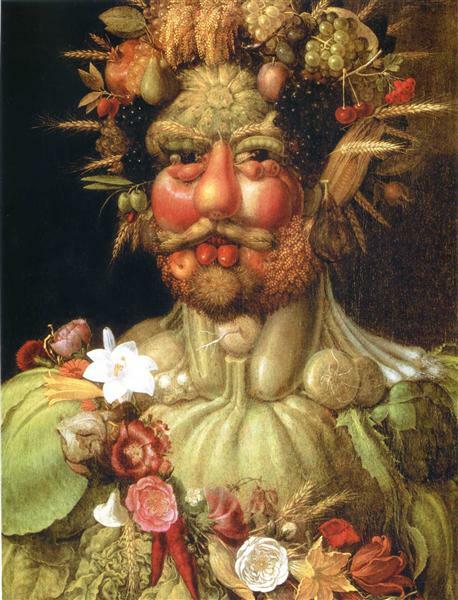 Not only did Arcimboldo use fruits, vegetables, plants, and animals as objects for the compilations in his paintings, he also used inanimate objects such as books and papers. The Librarian is one such painting. 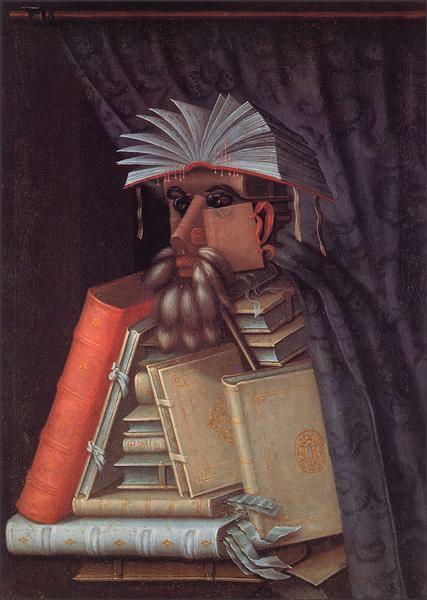 In this painting, Arcimboldo’s subject is obvious: a lover of books made up out of books. This is an example of the painter’s ability to be less literal. Whereas in other paintings, he shaped singular pieces of fruit or meat into the eyes, nose, or curve of the chin, in this painting, the pile of books only resembles a person, and upon closer inspection, the features become less clear. 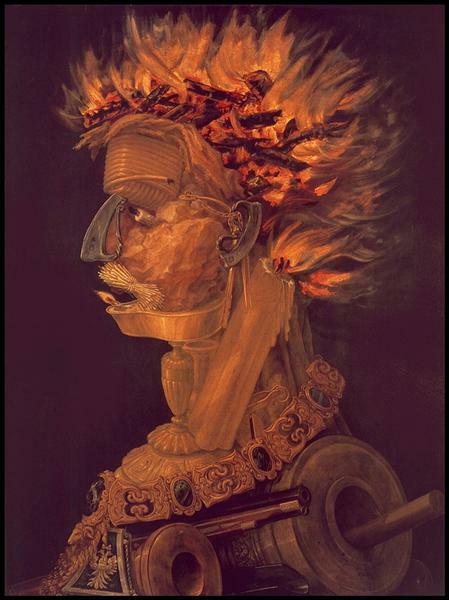 This is an example of Arcimboldo’s great talent of disguising his objects into the form of a person, or as in this case, disguising his person into the form of his objects. 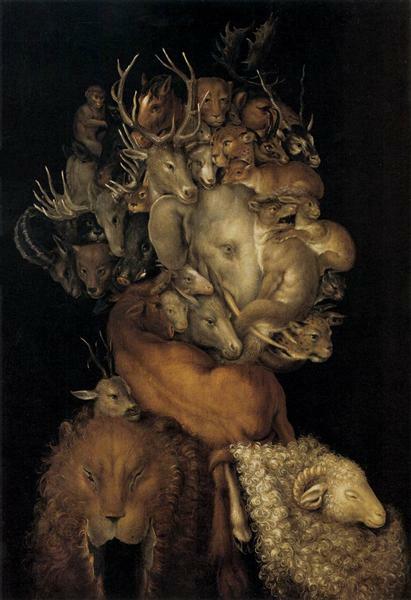 The Librarian is an oil on canvas painting by Giuseppe Arcimboldo in the collection of Skokloster Castle in Sweden. It is thought to be a portrait of Wolfgang Lazius, a humanist and historian who served Holy Roman Emperors of the House of Habsburg. 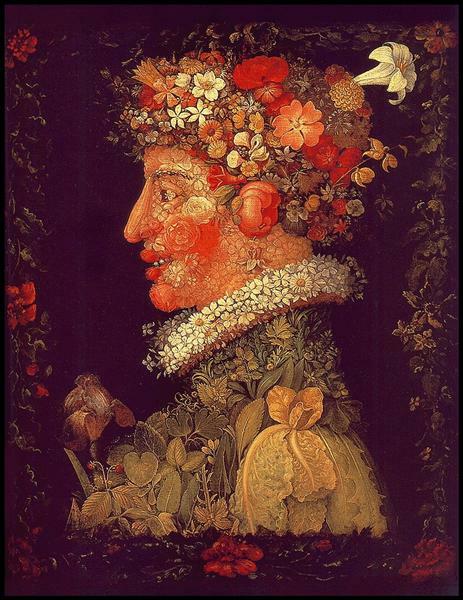 Arcimboldo became official portraitist to Emperor Ferdinand I in 1562 and later to Maximilian II and Rudolf II. 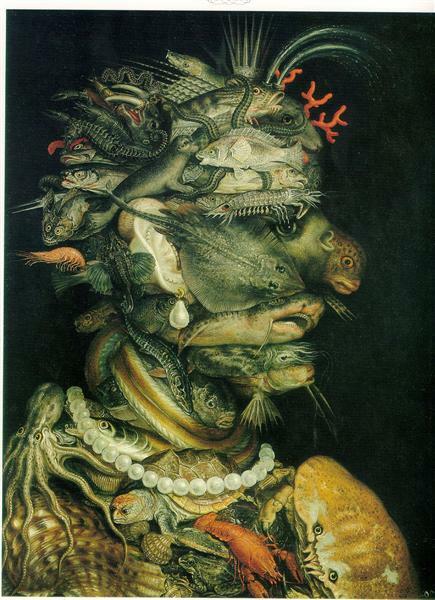 The Librarian is one of a series of paintings by Arcimboldo of members of Maximilian's entourage. Skokloster Castle dates the painting to 1562, though the painting is more often dated circa 1566. 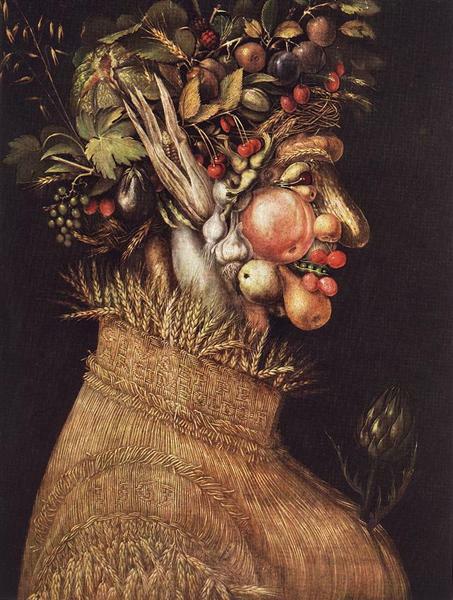 Arcimboldo created a number of portraits of people by painting an assemblage of objects such as fruits and vegetables, flowers, or in this case, books; the objects typically had some connection to the person's life or depiction. 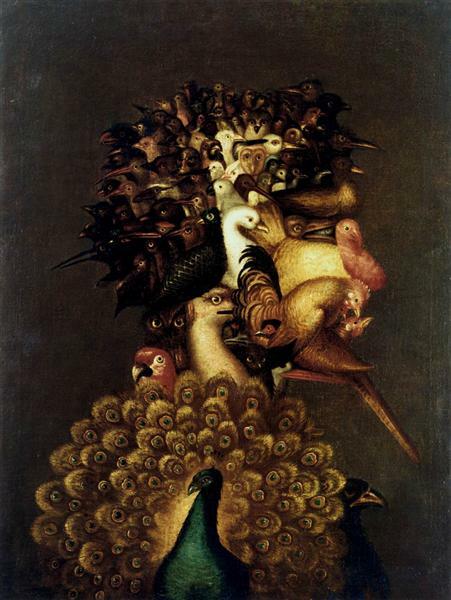 Benno Geiger called it a "triumph of abstract art in the 16th century". In 1957, art historian Sven Alfons was the first to conclude that this was specifically a portrait of Lazius. The work has been interpreted as both a celebration and a satirical mocking of librarians and scholarship. K. C. Elhard suggests that it may be specifically a parody of "materialistic book collectors more interested in acquiring books than in reading them." Elhard notes that The Librarian has become "a fixture in the visual history of the library profession". However, the original title, if any, is unknown, and its current title first appears (in Swedish as "Bibliotekarien") in an early 20th-century inventory. The Librarian is one of two works by Arcimbolodo in the collection of Skokloster Castle. The painting was brought to Sweden following the looting of Prague Castle by the Swedish army during the 1648 Battle of Prague and was owned by General Hans Christoff von Königsmarck. There are three other extant versions of the painting whose attributions are uncertain. A scientific study published in 2011 concluded that The Librarian was a later copy of Arcimbolodo's original painting, whose whereabouts are unknown.